¡O consíguelo por 5600 Kobo Super Points! Where It Hurts is a highly-charged collection of personal essays, haunted by loss, evoking turbulent physical and emotional Canadian landscapes. Sarah de Leeuw's creative non-fiction captures strange inconsistencies and aberrations of human behaviour, urging us to be observant and aware. The essays are wide in scope and exposing what—and who—goes missing. With staggering insight, Sarah de Leeuw reflects on missing geographies and people, including missing women, both those she has know and those whom she will never get to know. The writing is courageously focused, juxtaposing places and things that can be touched and known—emotionally, physically, psychologically—with what has become intangible, unnoticed, or actively ignored. Throughout these essays, de Leeuw's imagistic memories are layered with meaning, providing a survival guide for the present, including a survival that comes with the profound responsibility to bear witness. "In her poignant prose, those who suffer are honoured and memorialized." 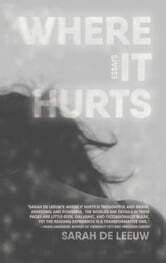 "Like 'Soft Shoulder,' the rest of the essays in Where it Hurts are tremendously moving. Beyond merely inviting empathy, they invite us to consider the wounds we don’t know are there." "The essays in Where It Hurts are deeply felt, original, and a moving requiem for lives extinguished too early to have left a trace." "In Where It Hurts, de Leeuw skillfully reconciles her background as an academic—she’s an associate professor at the University of Northern British Columbia and a researcher into the issues that affect marginalized communities—and a poet. What she chooses to say is intimately tied and ultimately revealed by the way she chooses to say it." "Perhaps the most productive way to read the essays about missing and murdered women and children is to see them as crucial conversation starters. Here, ideally yet uncomfortably, readers become responsible for what they witness; they must face these cruelties and find ways to move forward."